Lahore, November 02: Information Commissioner, Punjab Information Commission, Mr. Mukhtar Ahmad Ali (pictured left) shared highlights of the Punjab Transparency and Right to Information Act 2013 and outlined the obligations of government officials under it while addressing the participants of the Mid-Career Management Course at the National School of Public Policy, Lahore. 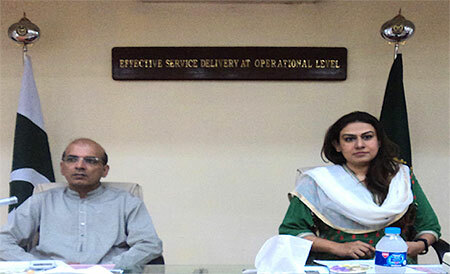 In her Inaugural Address, Joint Director PILDAT, Ms. Aasiya Riaz (pictured right) stressed the need for the regular sensitization of government officials on their responsibilities under RTI law. The Briefing Session was facilitated by PILDAT as part of “More Effective Right-To-Information (RTI) at Federal and Provincial level (Sindh and Punjab) Project” project, supported by Development Alternatives Inc. (DAI) under the Enhanced Democratic Accountability and Civic Engagement (EDACE) project.